Twelve crew members of a Swiss bulk carrier MV Glarus were taken hostage while in Nigerian waters on September 22, Reuters reports citing a statement from the ship’s operator Massoel Shipping. Based on the statement, the ship was underway, loaded with a cargo of bulk wheat, around 45 nautical miles southwest of Bonny Island when Glarus was boarded by a gang of pirates, who took 12 out of 19 crew members hostage. As disclosed, all relevant authorities have been informed of the incident and the company is pending to be contacted by the pirates asking for ransom. The incident is being reported five months after the ordeal of eleven seafarers from FWN Rapide, who were abducted by pirates off the coast of Nigeria in April. The seafarers were released after four weeks, however, the terms of their release were not disclosed. The Gulf of Guinea has become a major piracy hotspot. The second quarterly report from the ICC International Maritime Bureau (IMB) shows that all 2018 crew kidnappings this year took place in the GoG in six separate incidents, with 25 crew members being targeted by pirates. The true number of incidents in the region is believed to be “significantly higher” than what is reported to the IMB PRC. 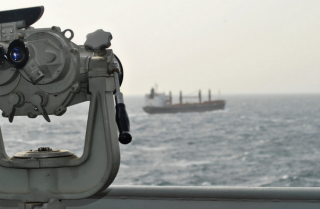 Based on the data from security services company EOS Risk Group, Nigerian pirates have taken 35 seafarers from vessels in the Gulf of Guinea from January through June 2018.